The best way to get to know Canmore and the surrounding area is on foot. And with a network of walking trails through town, along the river side and into mountain valleys, you won’t want to forget your camera. Some of the trails lead to picturesque Quarry Lake, follow a mountain stream through the community of Rundle, cross a beautiful old railway bridge, past stately hoodoos and into the slopes of the Benchlands. Give yourself plenty of time and wear sturdy walking shoes for a hiking tour of the area. Short, but oh so spectacular! This describes the Grassi Lakes trail to a tee. 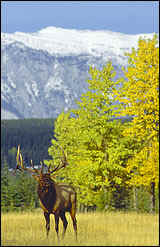 The trail is a 5 km loop which begins just past the Canmore Nordic Centre at the base of the Smith-Dorrien/Spray Trail. The trail begins on a fireroad, but quickly turns left onto a wooded trail. Before long, it opens up as it climbs towards some wonderful views of a waterfall. As you crest the summit of the climb, the lakes are only a short distance away. Turquoise and green in colour, they seem like magical pools as they sit at the base of an ancient coral reef. Above the lakes, atop a short loose scramble, native pictographs can be seen. Please refrain from touching the pictographs, and caution is advised for those climbing to view these ancient images. A short hike (45 minutes)to twin emerald lake nestled between towering cliffs – some steep sections and stairs. This one is well worth doing. Trailhead is off Spray Lakes Rd. Hike the km of trails at the Nordic Centre, paved trails are good for cycling and in-line skating. Hike the 20 km to Banff. A good trail right in town. Walk alongside the Bow River for some of the most spectacular scenery in Canmore. Parking available downtown or on River Rd. A leisurely stroll through the town. Get away from it all in the centre of it all. Look for ducks on the ponds. This 18 km trail drops 291 metres (957 ft.) from the summit of Whiteman Pass, to its terminus at the Banff Springs Hotel. It is wide and generally smooth, following former fireroad for much of its distance. It is most popular with mountain bikers, and hikers looking for a lengthy day-hike. Traversing the entire length of Mount Rundle, you are treated to numerous views of its steeply bedded slopes. Most riders prefer to have a vehicle waiting at the Banff Springs trailhead to prevent the need to return along the same trail. A popular cross country ski trail in the winter. Start at the parking lot on the Spray Lakes Rd. and hike to the Banff Springs Hotel. Start from parking lot on Elk Run Blvd. Hike up the canyon or head up the mountain for spectacular views of Canmore. Some very steep sections. A short guided interpretive walk among the ruins and foundations of historic site #1minesite. A short walk along the creekbed brings you to Canmore falls and Canmores own “cold” sulphur springs. This short trail offers a glimpse at the power of water as it follows a narrow runoff channel towards a delicate waterfall at trails end. The valley has been carved smooth by the action of running water leaving polished limestone. Along the way, if your eyes are keen, you may see some fading native pictographs. Damaged by years of being touched by curious onlookers, and by climbers ignoring their significance and climbing right over them, they are rapidly disappearing. Please respect their sensitivity and refrain from touching them. A popular hike just outside Canmore. Take 1A to Exshaw 14 km. From a signed highway pullout, this quiet trail parallels the highway for a short distance before turning sharply upstream to follow Heart Creek. 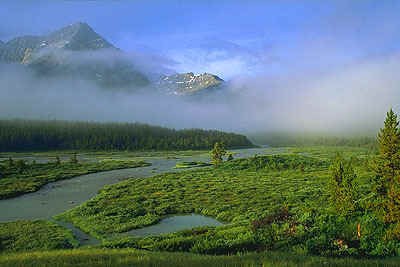 The valley quickly narrows as the stream bounces its way towards its junction with the larger Bow River. The trail offers views of steep limestone faces, some regularly challenged by rock climbers. At the trails end, a tiny waterfall hides around the corner just out of view. For those willing to accept wet feet, it is worth freezing them to view this pleasant cascade. During high water, stay safely on dry ground. If you love altitude, and don’t mind exposure, this trail may be the one for you. Beginning at the Heart Creek Day Use area, along the shores of Lac Des Arcs, it follows Heart Creek Trail for a short distance before assaulting the ridge. When the climbing begins, it continues unrelenting to the summit. there are no switchbacks, just straight climbing along a narrow, steep ridge. Why would you want to endure such a trail? One look over your shoulder as you climb this trail will give you the answer. The entire Bow valley spreads beneath your feet. This is a trail for expert hikers only.